Dr. San'ei Ichikawa is a chief researcher of Japan Wildlife Research Center. His academic specialty is forest ecology. He has been studying edible wildlives that are routinely used by the local people the Southeast Asia. In 2008, he joined the Satoyama Project. He witnessed wisdom of people who are cohabiting with wildlife for a long time. He also respects wildlife. Dr. Noboru Matsushima is a senior researcher at Japan Wildlife Research Center (JWRC). He is a socio-economist with a keen interest in favourable relationships between human activity and natural resource management in various developing countries. He has been implementing numerous field surveys in rural areas in Southeast Asia, China, the Middle and Near East, Africa, South America and the Pacific Islands, and making helpful suggestions since 1989. In the past, the Thai government had exclusive authority over forest management in Thailand, but since the end of the 1980s, local residents have taken on the responsibility. Community members help preserve and manage the resources in nearby forests, while still utilizing it to maintain their livelihood in a system known as “Community Forest”. In recent years, the Royal Forest Department has been supporting the establishment of community forests. They have instituted such improvements as the development of a management body and penalty based rule system, creation of GPS derived maps, maintenance of fences and sign boards and the establishment of fixed borders (Fujita, 2008). Currently, an attempt is being made to restructure the traditional system of sustainable natural resource use in the community forests of Chiang Mai in Northern Thailand, with the help of the NGO, Raks Thai Foundation (hereafter Raks Thai). Previous efforts to support and develop community forests have been made with the Karen people, a mountain tribe in Northern Thailand and Huai Han village, which is situated in a low-mountainous area near Chiang Mai. Meala Up Village is located in the basin of the Meala Up River, a major tributary of Chao Phraya River (picture 1). It has a population of 376 within 70 households. The region surrounding the village is approximately 800m to 1200m above sea level and the vegetation is that of the mid-highlands. 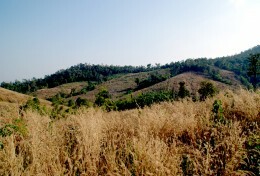 Both lowland and highland plants are capable of growing there meaning that the area has the most abundant variety of plant species in Northern Thailand (Gardner, 2007). Pinus kesiya forest can be found 950m above sea level and constitutes the characteristic scenery of the area. The rainy season is from May to October and the annual precipitation of about 1,280mm is very dry for a tropical area where the plants require a high moisture content. The types of land use allowed in this area are rice terrace, cultivated land (orchards, vegetables, pulse and tubers) on gently sloping land, and forests in the higher areas (figure 3). People are engaged in rice farming, swidden cultivation, crop farming and livestock farming. Corn is also cultivated for animal consumption, but is not recommended by Raks Thai as the conversion of forest to corn fields leads to a higher rate of deforestation. Roads were built in this area in 1983 and electricity was first supplied in 1998. Raks Thai is contributing to sustainable resource use in a variety of ways. They place an emphasis on forest conservation as a means to protect local people’s livelihood and seek to utilize traditional wisdom in managing forest resources. One such example of traditional wisdom is the “Umbilical cord forest”. Long ago, people in this area followed the custom of designating a tree for each baby and tying the umbilical cord of the newborn baby around the trunk of the tree. That tree was then considered a member of the family and lived with them in the village. This is an important custom in passing down the significance of the forest to the next generation and is viewed as a symbol in the management of community forest (picture 3). In this way, local people understand the link between the forest, its function as a water source, and their own lives. Forests have long been regarded as a spiritual support for the people, and this belief is passed on through ancestral verses and songs emphasizing the existence of “spirits in the forest”. A modernized adaption of the “Umbilical cord forest” is through T-shirt sales. The proceeds from the sale of each T-shirt are used to plant a tree and the tree is given a name plate with the buyer’s name on it. The buyer is regularly updated on the progress of their tree via email. An original approach has been taken in regard to education in environment and traditional matters. Rather than rely solely on central government curriculum, the local people teach local affairs to school children and they learn by taking part in slash-and-burn or tree planting events. In addition, biogas is used as a small scale energy source that effectively utilizes regional resources. Each family collects manure from their livestock and uses it to generate methane gas. By adding 5 kg of manure every day, each family can generate enough gas for about 50 minutes (picture 4). Resource use efficiency has been improved by the introduction of the stove in replacement of the open hearth system, thus reducing the need for firewood (picture 5,6,7). Raks Thai encouraged each family to create a small home garden by which people can cut expenses and meet most of their daily consumption needs. Edible trees such as pear (Pyrus sp. ), longan (Dimocarpus longan), shaddock (Citrus maxima), papaya (Carica papaya), tamarind (Tamarindus indica), guava (Psidium guajava), jackfruit (Artocarpus heterophyllus) and castor-oil plant (Ricinus communis) contribute to their self sufficiency. Traditionally, Karen tribe has a culture of collecting and eating a diverse range of wild plants and animals on a daily basis (picture 9). These have been compiled by Raks Thai (figure 2). Euphorbiaceae Phyllanthus emblica Fruit is edible. Treatment for jaundice. Important in Hinduism. Leguminosae(P) Dalbergia cultrata Tree is durabile. Anacardiaceae Semecarpus cochinchinensis Natural resin is poisonous and causes itchiness (rash). Proteaceae Heliciopsis terminalis Important tree in Hinduism. Fagaceae Castanopsis acuminatissima Fruit is edible. Euphorbiaceae Antidesma sootepense Fruit is edible. Leaves are effective for headache when applied (covered). Proteaceae Helicia nilagirica Fruit is edible. Fagaceae Quercus kerrii Trees are used to grow mushroom or processed for use as a tool. Theaceae Schima wallichii Tree makes skin itchy. Broth of leaves is effective for diarrhoea, the flower is used for uterine disease. Hypericaceae Cratoxylum formosum Mix of leaves and coconut soup is effective for skin disease. Bark is used as a brown dye. Dilleniaceae Dillenia parviflora Processed to be used for various kinds of furniture. Theaceae Eurya nitida A variety found only in Thailand. Edible. Ulmaceae Trema orientalis Leaves are used for animal food. Fruit lures bird. Lauraceae Phoebe lanceolata Leave are used for animal food. Lauraceae Machilus bombycina Good quality tree used as building material. Myrtaceae Eugenia fruticosa Fruit is edible. Attractive to birds. Table created with material provided by the Raks Thai Foundation. The village of Huai Han (picture2) is in the south of Chiang Mai and about 300m above sea level. This region is the source of the Li River, one of tributaries to the Chao Phraya River. Raks Thai is working on environment education and environmental projects for mountain tribes in 29 villages around Huai Han. In Huai Han, the land is zoned according to use. The related lands are categorized into three types: forest reserve, forest in use and cultivated land. By clarifying the purpose of each area of land, the village aims to secure protection of the forest. Water is conserved by the use of a check dam, (picture 13) which is created by piling up sandbags and stones and is effective for storing a certain amount of water. The check dam ensures that rivers running through the forest, that previously dried out in the dry season, are kept flowing year round. The forest is also used as a place for environmental education with observation points being set up along a trail to explain regional culture, legends and medicinal herb use, in an effort to spread ecological and traditional knowledge (figure 3, picture 14). 1 Pepper Peppers are planted under trees. They serve to protect the forest as well as for use. 3 Check Dam Water retention in small streams is essential for reforestation as dryness is a problem. The dam was created five years ago using sandbags and big stones and is repaired from time to time. 4 Water Water can be drunk from a bamboo tub which gathers water from forest leaves. This teaches the link between water and the forest and a local legend tells about the spirit which appears at the water source. 5 Thousand-year Acorn Large tree of the chestnut family. Home to arboreal mammal. Causes dizziness when eaten. 6 Bamboo Bamboo shoots sprout from May to July, but collection is prohibited here. 7 Mako Tree Wild olive used as medicine. Fruit is sour and bitter. Effective as cough remedy and antifebrile. 8 Big Elephant, Pruh Lianous foliage plant believed to bring happiness. 9 Squid Arm Herb tree. Medicinal plant. Only tree in the county. Laxative. Trim stems. Herb ball works as a painkiller. 11 Shrine Enshrines a spirit. A festival is held in June and a pig is offered to the spirit. Root of ficus tree covers a rock. 12 Medical Herb Garden Herbs are named and numbered so people can learn about them. Traditional therapy. 13 Forest of trees used for mat Plant with large leaf grows in wet land. It is used as a material for mat weaving. Raks Thai Foundation was established in 1997 and is composed of 250 staff and 125 volunteers. Its area of activity covers the whole of Thailand. Activities run by the organization include rural development, nurturing cottage industry, environment conservation, mountain tribe development, AIDS prevention, coexistence education, environment education, production of supplementary reading material for social study on health and AIDS. Raks Thai places emphasis on human resource development, development of community for education and training, leadership training and technical guidance. This research was conducted through review of published literature and fieldwork by Japan Wildlife Research Center, Noboru MATSUSHIMA, San’ei ICHIKAWA as part of a project commissioned by the Ministry of Environment. Fieldwork was carried out from January 11th to 21st 2009 in the village of Meala Up, Jumlung town, Mae Chaem county, Chiang Mai province in northern Thailand and in the village of Huai Han, Thung Hua Chang county, Lamphun province. Research took the form of interview of local residents with the cooperation of Raks Thai Foundation which operates regional support activity throughout Thailand. Information was also gathered from Raks Thai Foundation regarding their basic stance toward these and other activities. In Meala Up, an interview was conducted from January 14th to 16th 2009. Interviewees were the former mayor of the third village of Meala Up who is also a representative of the Meala Up Watershed Network, committee members of the Network, the mayor of the fourth village, Phaibaper and others. In Huai Han, an interview was done while inspecting forest reserve and forest in use together with the village mayor and others on January 12th 2009. Information was also taken from the previous research conducted by the Japan Wildlife Research Center in Huai Han in 2007. Fujita, Wataru. 2008. The Socio-political Process of the Community Forest Bill Controversy in Thailand, Southeast Asian Studies 46(3) pp.442-467. Sato, Jin. 1999. Public Land for People: Institutional Foundation of Community Forestry in Thailand, Southeast Asian Studies 37(1) pp.65-89. Simon Gardner et al. 2007. A Field Guide to Forest Trees of Northern Thailand, IUCN.